This is one huge antenna. Our HD8200XL clocks in at over 11 feet long and is the largest antenna you can buy for consumer use. If you need something like that, you’ll be glad it’s available, but do you really need something like that? The largest part of this antenna is designed to pick up Channels 2-6. It’s really not any more powerful in picking up channels 7-51 than most other antennas. 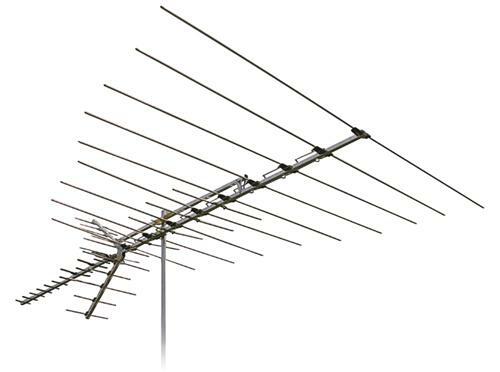 In fact, if you don’t even need channels 7-13 you can usually make do with a much smaller antenna. There are very few channels that actually broadcast on channels 2-6 any more… we have the full list here. The trick is that most TV channels aren’t on the frequencies you think… you can check Wikipedia, Antennaweb, or other sites to find out the actual frequency being used. Broadcasters hide their actual frequency assignments because they’re often different from what they were ten years ago before the transition to digital television. Once you’re sure you have no need for channels 2-6, a whole universe of possibilities open up to you. If you don’t need channels 7-13, you can even make do with a much smaller antenna. UHF channels (14-51) respond very well to smaller antennas because their actual waves are smaller, and an antenna works best when it’s either the same size or an even fraction of the same size as the wavelength it’s trying to pick up. In fact, you’ll have so many antenna choices that it’s going to be hard to know what you’ll need. That’s where your friends at Solid Signal come in. Give us a call at 877.312.4547 or send an email to info@solidsignal.com with your questions. Or, click the “Forum” link at the top of this page and post a question that will help the whole community understand!